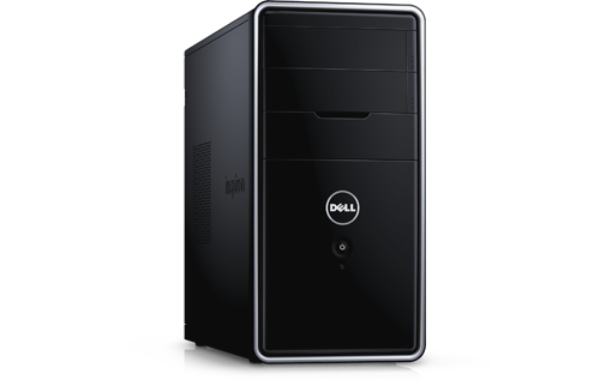 Space-saving desktop design perfect for small spaces and ideal for expandability. Featuring Intel® processors and discrete graphics options. Easy expandability: You’ll never be short on room with up to 1 TB of space and the option to add more later. Power player: Boost performance with up to 4th Gen Intel® Core™ i5 processors. Run multiple programs at once so you can edit videos, listen to music or watch a movie at the same time with less lag. Gorgeous graphics: Play games, watch movies or edit photos in beautiful detail with optional NVIDIA® GeForce® performance graphics with up to a 1 GB DDR3 graphics card. Optional HD monitor: Watch a slideshow of vacation photos or put together your budget on an HD or Full HD display of your choice. Choose the screen size that best suits your needs with the added flexibility to upgrade to a second display or larger monitor later. Windows 8.1. Learn how to personalize your desktop with great new apps and features that make multitasking a breeze.Windows® 7 options available on select Inspiron desktops. It’s easy to connect to your other devices with convenient accessibility to plenty of ports so you can link up your camera or HDTV to exchange data, or even charge devices. You’ll also get USB 3.0, standard WiFi, 1 TB of max Hard Disk Drive and Bluetooth®. You can maximize the versatility and performance of your Inspiron Desktop with essential accessories like a Dell monitor with ultrawide viewing or a wireless keyboard and mouse combo for a clutter-free desktop. Choose a Dell touch monitor or add a Dell wireless touchpad for an outstanding Windows 8 experience. Add a Dell printer for a reliable solution to home printing. You’ll find just what you need at Dell. Take advantage of your premium graphics with a 23” Full HD (1920x1080) display. Images are rich and clear on this glossy, virtually borderless screen. Use the included wired keyboard and mouse or upgrade to this wireless set with low-profile keys and optical tracking. Add touch to your Windows 8.1 experience with this plug-n-play pad. Edit videos and browse the web with gesture. No cords attached. Amazing 5-point touch, HD screen clarity and fast 2ms response time make accessing touch apps natural and intuitive when used with Windows 8. Print brilliant, high-quality color with the easy-to-use C1660w color printer with LED technology and wireless connectivity. 90 days Premium Phone Support: 24x7 advanced phone support for hardware and software issues (including support for 3rd party software). You can count on us for a great experience and rapid support. One year In-Home Service after Remote diagnosis*: Have a technician and/or part dispatched to your home following remote diagnosis if the issue is covered by Dell’s Limited Hardware Warranty*. Accidental Damage Service*: Let us repair or replace your system in the event of an accident. Accidental Damage service covers surges and screen breaks, liquid spills, accidental drops and falls.